Pinnacle Systems has for many decades been designing and supplying the industrial manufacturing sector with machine guarding products, electronic safety devices and safety controls. Our safety controls are used to interface the specific guarding device(s) to the machine control in a mandated control reliable fashion. Our products have been time tested to be extremely dependable, feature intensive and to provide a cost effective solution for solving complex machine safeguarding projects while protecting your most valuable resource, the employee. Pinnacle Systems has designed, manufactured and serviced a variety and multitude of machine safeguarding devices used for fulfilling the machine guarding and control needs of industrial manufacturers. These safety devices include safety light curtains, safety mats, ergonomic palm buttons, safety relays, safety controls and much more. These machine guarding products provide assurance to the employer and the machine operators that we can safely guard hazardous areas and the dangerous point of operation requirements of industrial machinery. Applications such as power press guarding, press brake guarding, robot guarding and automation guarding are just a few examples of our machine safeguarding capabilities. Operator safety is our priority while effectively maintaining product quality. Due to our overall safety design experiences, we design into our products unique features that will provide high levels of productivity and overall equipment efficiency (OEE) for the employer. Properly designed and interfaced safety devices and controls can have an extremely positive end result on production throughput. A machine’s risk assessment safety requirements will be met with our feature intensive safety product mix. 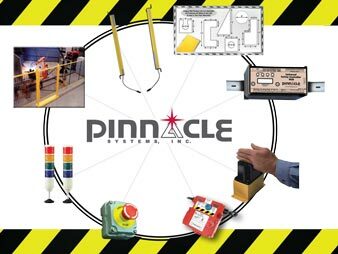 Pinnacle Systems is driven by creating machine safeguarding products that comply with or exceed OSHA (Occupational Safety and Health Association) and ANSI (American National Standards Institute) safety and control requirements. In addition, compliance with international machine guarding bodies such as ISO, CSA and CE are recognized within our machine safeguarding designs of products. As an additional employer benefit, safety compliance with the above stated safety laws for machine safeguarding will help reduce Workman’s Compensation insurance rates. Pinnacle Systems is a technical resource and acts as a liaison to industrial manufacturers for interpretation of various safety standards and how a specific safety standard will relate to a particular machine that requires machine guarding. The machine that needs to be guarded may it be mechanical, pneumatic, hydraulic, and electrical or a combination of these various power sources will be addressed and reviewed. Pinnacle Systems will then apply the appropriate safety device(s) for machine safeguarding to comply with specific laws and standards while maintaining efficiency for maximizing the machine’s overall efficiency (OEE). The safety products, safety controls and safety devices used for guarding the hazardous areas and the point of operation manufactured by Pinnacle Systems are Made in USA.